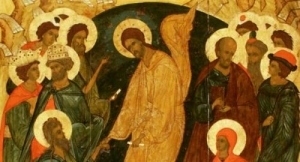 In the middle of the 20th century the Soviet authorities finally acknowledged Andrei Rublev being an outstanding Russian painter and decreed that the Museum-Preserve of the Old Russian Culture and Art should be established. The Museum was to be established on the territory of St. Andronicus Monastery of the Savior where presumably the grave of the great icon painter Andrei Rublev is located. Founded in the beginning of the 15th century by Andronicus, who was the follower of Sergey Radonezhsky, the monastery for many centuries played an important role in the religious life of the country. In the early 15th century Andrei Rublev became a monk of St. Andronicus Monastery. There he created a plenty of splendid icons and painted the walls and vaults of the Savior Cathedral that is nowadays one of the oldest monuments of Moscow stone architecture. In St. Andronicus Monastery of the Savior Andrei Rublev spent the last years of his life and in 1430 was buried on the monastery territory. The monastery that had been savagely damaged in the years of the atheism was carefully restored. Even the brick wall with the towers that had been partly demolished took its original form. The opening of the Museum took place in 1960 and was timed to the six-hundredth anniversary of the great Russian painter's birth. At first the Museum collection included only copies and photos but gradually it was enriched with icons that were wrote off as dilapidated ones in provincial museums. The collection of the Museum was also enlarged with the unique finds of scientific expeditions to different regions of Central and North Russia. Nowadays the Museum is proud of its rich collection that features icons of the 14-19th centuries including works of Moscow, Novgorod, Tver and North Russian icon schools. The Museum also represents the fragments of religious monumental painting from the architectural ensembles of the 12-15th centuries as well as Old Russian wooden sculpture and unique works of decorative and applied art. The collection of the Old Russian books features books and manuscripts kept in the library of St. Andronicus Monastery and hand-written books of the 15-20th centuries. The pride of the Museum is the collection of the original frescoes of the 15-19th centuries and copies from church and monastery frescoes preserved in the unique religious architectural monuments of Russia of the 16-18th centuries. In 1985 in the small park in front of the entrance to the Museum the monument to Andrei Rublev was opened. The accuracy of the portrait is rather relative, as the description of the painter's appearance hasn't preserved. On the territory of the Museum different types of excursions are held, giving the visitors a chance to get acquainted with the masterpieces of the Old Russian culture and art in the natural surrounding. 28/6 build. 3 Pokrovka St. The Bentley hotel is located in the center of Moscow, on a historic street, not far from the Kremlin and Red Square.